It's amazing the transformation some foods can take once they've been grilled. Take watermelon, for instance -- we think of it as sweet like a dessert that's perfect to cool you down during the hot Southern summer. 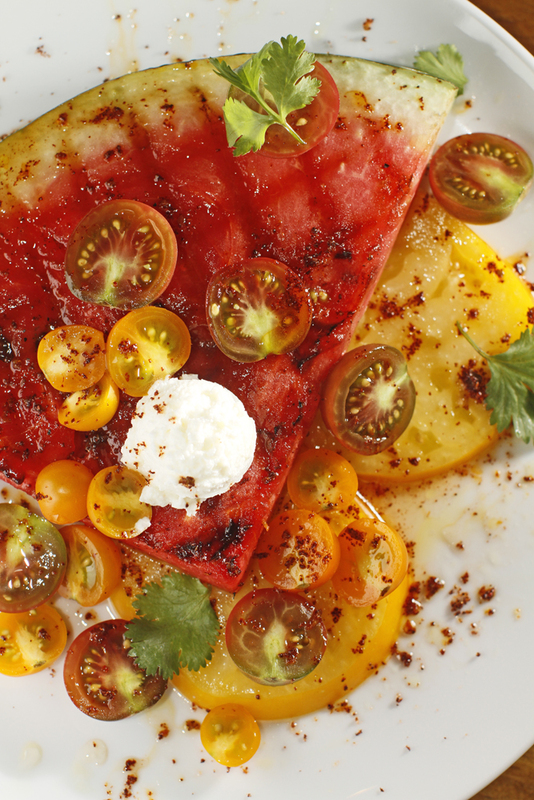 Add a little heat from the grill, some more heat from chilies, and the watermelon slices transform from sweet to savory. This is the perfect salad for an outdoor BBQ because you could just grill the whole melon, double the dressing, and feed a every last person. Start by cutting 2 1-inch thick slices from the heart of the watermelon. Cut watermelon slices into quarters. Preheat your outdoor grill to high. Grill one side of the watermelon slices until the sugar starts to caramelize. The watermelon should be well-marked by the grill grates. Remove melon slices from the grill and set aside. Do not flip and grill the other side because then the watermelon will fall apart. To serve place 1 to 2 slices of yellow tomato on the serving plate, top that with 1 to 2 slices grilled watermelon, 1/4 cup of the halved cherry tomatoes, and 1 ounce of the soft goat cheese. Drizzle 1 tablespoon of the Honey-Lime Vinaigrette over the dish, sprinkle with 1/4 teaspoon of ancho chili powder, and salt to taste. Finish the dish with a few fresh cilantro leaves. Repeat the process for each serving. This is the perfect thing to serve at a summertime dinner party. It makes use of the best produce of the season, plus it's cool and refreshing. Place the lime juice, zest, honey, olive oil, and cayenne in a small jar with a lid and shake it until the dressing emulsifies. Set aside until ready to use. One of the best ways to get an idea is going through family recipe cards and being reminded of the things that were at the table when you were a child. This egg custard is based on one of my grandmother's cards and is attributed to her friend Dot. Egg custard makes a wonderful pie, but here, brûléeing it and peppering it makes it a standout all on its own. Preheat oven to 325 degrees and bring a pot of water to boil on the stovetop. In a medium pot over high heat, scald milk -- while stiring it constantly. Remove milk from heat as soon as it boils and add butter. In a large bowl mix the eggs and sugar, vanilla, and nutmeg. Add hot milk to the egg mixture in a slow, steady drizzle as you whisk. This will temper the eggs. 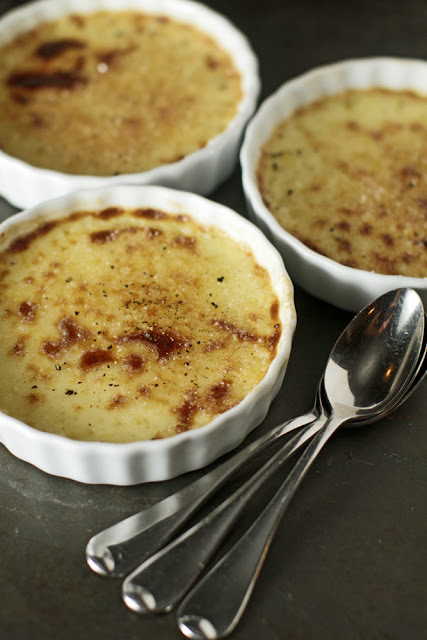 Pour custard mixture into ramekins or shallow 5-inch-across brûlée dishes -- custard being about an inch in height is best. Put these in a hot water bath halfway up the side of a larger vessel. Place in the oven and bake for 15 minutes or until just set in the middle. Remove them from the water bath and allow them to cool. Just before serving sprinkle each custard with a teaspoon of cane sugar and then broil on high while watching them the entire time. It take about a minute for the sugar to caramelize and happens pretty quickly. Remove from oven. Top each custard with a pinch of cracked black pepper. Enjoy! My grandfather, Ode (short for Odell), was a funny guy. He could’ve had the whole room laughing before he even told a single joke. 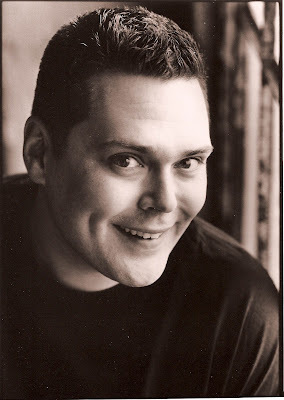 In fact, I don't recall that he ever got through an entire joke to deliver the punch line, actually. He would get ahead of himself, start chuckling, and then that was it; we'd all lose it. Knee-slapping, eyes crying, gasping for breath, we would all beg him to finish the joke, but by that time, the punch line could not have been more fun than the laugh we were already having. Every summer there came a time. Ode would stand atop the step stool, reach far back into the top shelf of the pantry, and bring down the cedar bucket along with the crank to attach to the top. We'd gather the rest of the materials: rock salt, ice, cream, sugar, and a brown paper bag of ripe peaches. I'd mix up the cream and sugar per his instruction as he removed the pits and sliced the peaches. He did not waste precious time dicing or blending the peaches; we'd just throw the big slices into the bowl. I couldn’t stand the anticipation. Once the ice cream container was submerged in ice and concealed by the cedar bucket, I knew it would not be long. We'd take turns turning the crank. There was a strict no-peeking rule. Thirty minutes later, which seemed more like 30 years, we'd scoop generous bowlfuls of peach ice cream and distribute them to all of the family members -- even though they didn't help. Then it was time. Time for peach ice cream. Homemade peach ice cream is always great in the summertime, but we wondered if it was possible to make this traditional Southern recipe even better. Why not grill the peaches before adding them into the cream? It's smoky, savory, and a whole different level of great. Served with slices of grilled peach, this is a must for your next summer cookout. Put the freezer bowl of the ice cream maker in the freezer for 6 hours prior to making this dish. 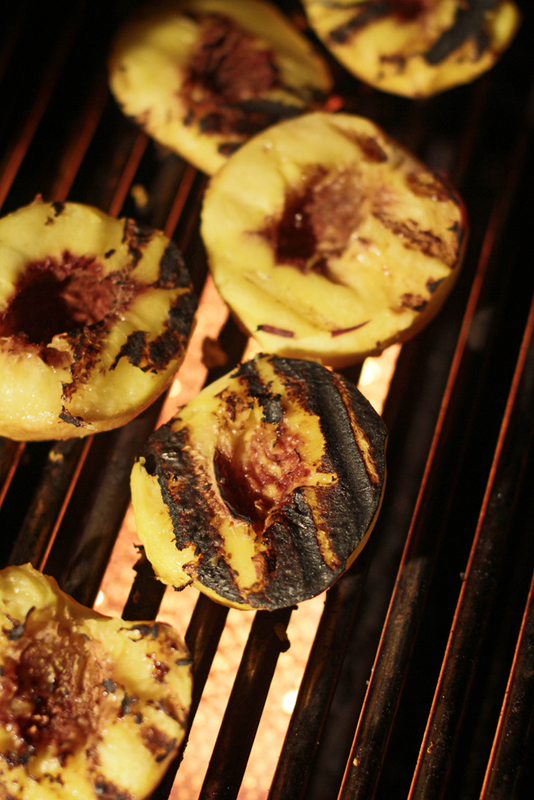 Over a high flame on an outdoor grill, grill peaches cut-side-down until well marked by the grill grates. You want some of the sugars to blacken. Using tongs flip the peaches and grill the other side. Remove peaches from the grill and set aside. takes 20 minutes for the mixture to freeze. Eaten immediately out of the ice cream maker, this ice cream's texture is similar to soft serve ice cream. You may also scrape the mixture into a food storage container and harden it in the freezer which will give you a more scoop-able consistency. Just remember to remove ice cream from the freezer 10 minutes before serving so it's easier to scoop. 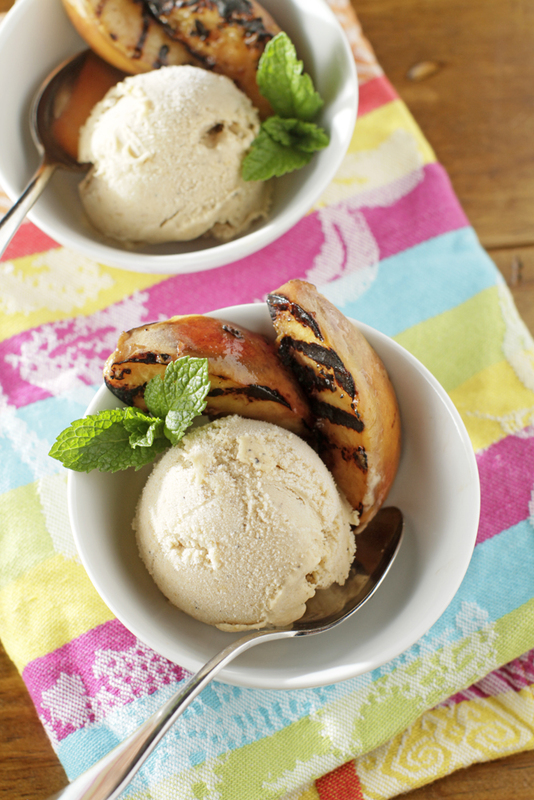 To serve scoop a generous portion of Grilled Peach Ice Cram into a bowl. Serve alongside warm grilled peaches and a sprig of mint. How did curry, with its roots in Asia, made its way into so many of our grandmothers' recipes, and why was the exotic spice in recipes found in community cookbooks all over the South. Even in our family, we have had curried cauliflower soup at Christmastime for as long as I can remember. But why? Then one day, we heard the story behind a Carolina dish called Country Captain, which had its heyday in the 1950's country club scene. Legend has it that a British sea captain who was working in the spice trade introduced the dish and the spices required to make it to Southern port cities like Charleston and Savannah. From there, adventuresome Southerners made it their own. We feel very connected to this dish and the story behind it because the idea of seeing world cuisine through a Southern American lens just about sums up what we do here at The Chubby Vegetarian. Our County Captain is made with thick, hearty slices of eggplant rather than chicken. The spongy eggplant soaks up all the wonderful spices. This is the perfect thing to make for a crowd as it'll easily feed six people, and because it's a casserole, it requires very little hands-on time. Into the work bowl of your food processor, add the onion, tomato, ginger, garlic, jalapeño, apple, cilantro and lime zest. Blend for 3 minutes or until smooth. Set mixture aside. Preheat the oven to 350 degrees. In a Dutch oven over medium-high heat, melt the butter and add the coriander, cumin, turmeric, and curry powder. Stir to incorporate spices into the butter. Allow them to cook for about a minute or until they become very fragrant. Add the mixture from the food processor and stir. Stirring occasionally, allow this mixture to cook until most of the liquid has evaporated -- it'll be very thick and paste-like. This takes 10 minutes. Add the salt, sugar, coconut milk, broth, sambal (if you like it spicy), cinnamon, raisins, potatoes, beans, and papers to the pot. Stir, put the lid in place, and reduce the heat to low. Allow mixture to simmer for 5 minutes while you prepare the eggplant. Trim the stem end of the eggplant and slice into generous 1/2-inch slices. You should end up with 6 good-looking slices and the trimmings from the end. Sprinkle both sides of the pieces with salt and pepper to taste. In a 12 x 9 inch casserole dish, lay the eggplant slices down in a shingle-like pattern. Using a large ladle, spoon the warm mixture from the Dutch oven over the top of the eggplant slices. Cover with foil and place dish in the oven for 1 hour. Using a spatula place 1 large slice of eggplant in the center of a dinner plate. Spoon some of the mixture from the casserole over the top of it. 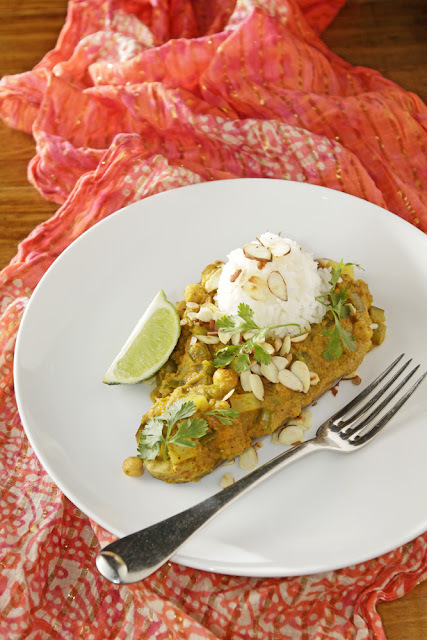 Garnish the dish with 1/4 cup jasmine rice, almonds, cilantro leaves, and lime wedges. Add salt and pepper to taste. Start by hard boiling the eggs. First, add the eggs to a cold, medium pot. Next, pour in a cup of white vinegar, and then add 1/4 cup iodized salt and enough water to cover by 1 inch. Over high heat bring the contents to a boil. Once it is boiling rapidly, turn the heat off and cover. Leave the eggs in the hot water for 10 minutes. Remove the eggs to an ice bath and allow them to chill completely. Roll the egg under your palm on a cutting board in order to fracture the shell completely. Under cold running water, pick the shell off one piece at a time until the egg slips out of the shell. Set egg aside. Using a sharp knife cut the hardboiled eggs in half longways. Carefully push the yolk out of the center of each the egg. Set egg whites aside in the refrigerator until filling is ready. Place the yolks into the work bowl of a food processor along with the mustard, mayonnaise, red pepper flakes, and celery. Blend until smooth. In a small bowl mix the yolk mixture with the sliced olives. Using a small ice cream scoop, scoop 1 tablespoon of the mixture into the center of each egg white. 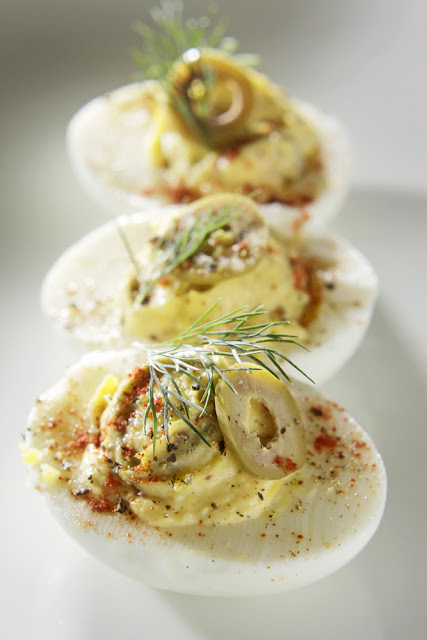 Garnish with a small sprinkling of sweet paprika, a thinly sliced green olive, a sprig of dill, and cracked black pepper. Serve at your next party, potluck or gathering. This cake sounded great. The squash cakes and spicy chocolate cakes we've made from this wonderful book have become staples. 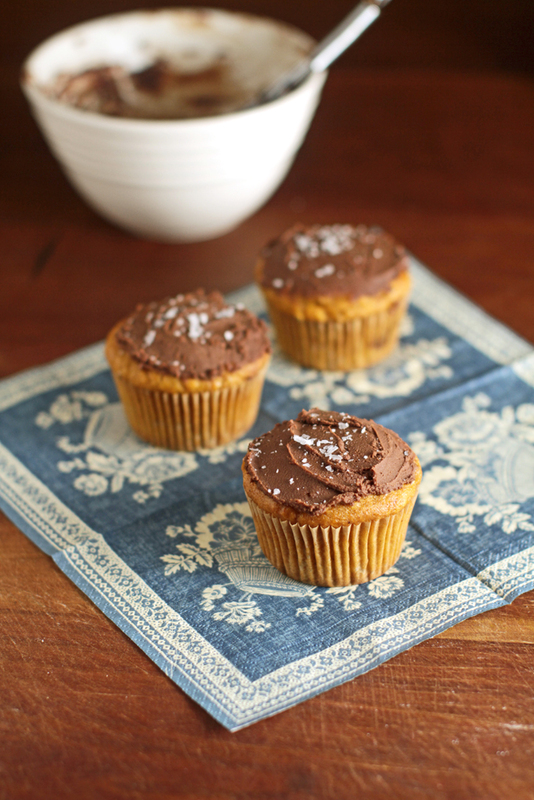 We had some leftover roasted squash, so this is what happened next in our kitchen. Ah, cooking...it's such a long, continuous chain of the things people have already made before you got there first. Being inspired along the way is a beautiful thing. Preheat oven to 350 degrees. Whisk together the squash, eggs, oil, applesauce, sugar, and vanilla. Mix well until there are no lumps. Set aside. Whisk together the flour, baking powder, baking soda, salt, cinnamon, chili, and cayenne. Pour squash mixture into the flour mixture and fold to combine, but don't over mix. Stop right when you can't spot any more flour. Use a spring-loaded ice cream scoop to portion batter into a lined muffin tin. Bake for 35 minutes. Melt the chocolate and margarine. Whisk in the powdered sugar and cream. Let it cool 3-5 minutes in the fridge and then spread a thin layer on top of squash cupcakes. Sprinkle just a pinch of Maldon on top of frosted cupcakes. This chili gets depth from a multitude of sources: smoky chipotle chili powder, soy sauce, and espresso. The texture, which so many vegetarian chilis lack, comes from chopped peanuts. This also adds a nice touch of protein to the dish. I got the idea for this chili while Andrew Adams and I were brainstorming ideas for the Farmer Mixer. I wanted to do a kim chi dumpling, and he thought it'd be cool to use peanuts as the protein like they do in a soup at The Brushmark. It was a perfect marriage. 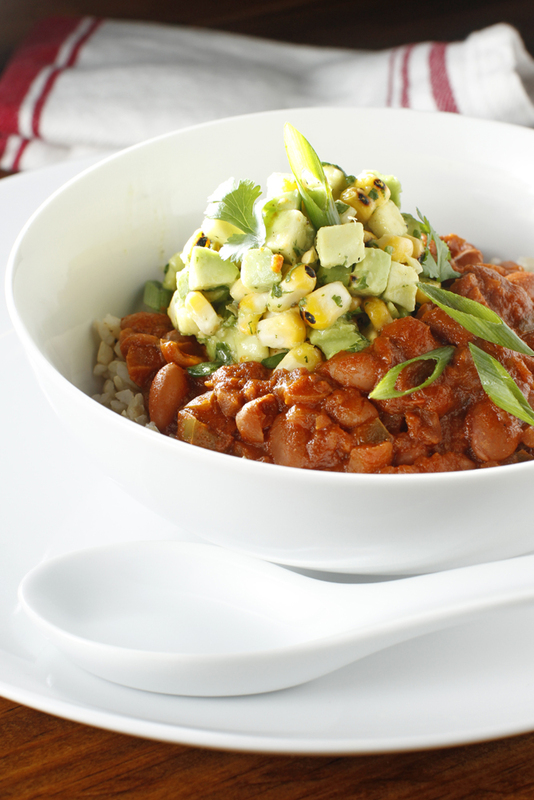 The Charred Corn and Avocado Salsa is the perfect thing to cool you down as you chow on this spicy chili. Try it on its own for a quick appetizer at a party, or add fresh, chopped jalapeño to give the salsa a little kick. In a Dutch oven or heavy soup pot over medium-high heat add the olive oil, onion, and garlic. Cook for five minutes or until onion is translucent. Add the ancho chili powder, cumin, smoked paprika, and chipotle chili powder. Stir to incorporate the spices then deglaze the pot with the wine or beer. Allow the mixture to reduce until most of the liquid has evaporated. Add the green peppers, soy sauce, espresso, worcestershire, peanuts, tomatoes, vegetable stock, tomato paste, vinegar, brown sugar, and pinto beans to the mix. Stir and bring up to a boil. Reduce heat to low, cover and allow chili to cook for an hour and a half or until beans are tender. To serve add 1/2 cup of rice to a bowl followed by a ladleful of the Peanut Chili. Top with 1/2 cup Charred corn and Avocado Salsa. Over a high flame on your outdoor grill car the ears of con until lightly blackened. This will take four minutes per side. Cut the corn away from the cob using a sharp knife and plenty of caution. In a medium bowl combine the corn, avocado, lime juice, cilantro, green onion, olive oil. Add sea salt and cracked black pepper to taste. Set aside until ready to serve. This is a riff on a dish taught to me by one of the best home cooks I know: Mrs. Brame. That's my best friend's mom and grandmother to my goddaughter. She came over to the kitchen one day and showed me how to make two Brame family staples: Pizza Chiena and Cabbage with Dumplings. I'm so grateful that she shared these recipes with us. 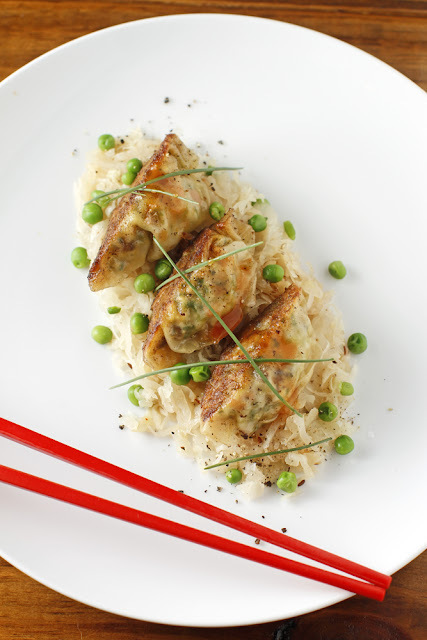 Here's the idea of serving cabbage and dumplings and added a little twist. I stuffed the dumplings with vegetables and spices. 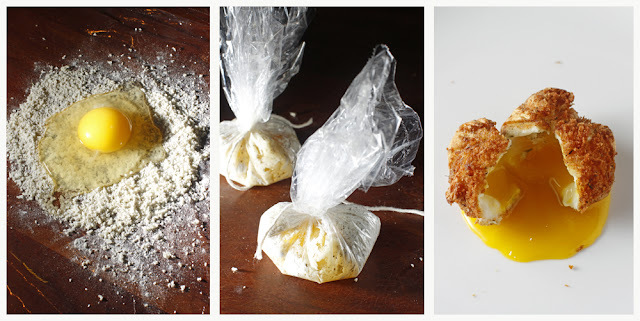 They are meant to remind the tastebuds of little self-contained chicken and dumplings. If you have a wok, now is a great time to bust it out. If you don't, a 12-inch frying pan will do just fine. Heat the pan over high heat. Add the canola oil. Once the oil starts to shimmer, add the crumbled tofu. Believe it or not, you want the tofu to stick a little. Allow it to cook for three minutes and then scrape it off of the bottom of the pan using a metal spatula. Allow the tofu to cook another two minutes or until nicely browned. Add the sage, thyme, garlic, peppers, carrots, celery, and vinegar. Cook for another three to four minutes, just enough to take the rawness out of the vegetables. wonton wrapper into the water and place the wrapper flat in the palm of your hand. Place about a teaspoon to a teaspoon and a half of the cooled filling in the center of the wrapper. Now fold the wrapper on the diagonal like making a paper football. Set the dumpling upright in the palm of your hand. Crinkle and pinch the edges to seal them. Place the dumpling on a very well floured piece of parchment. Repeat. Choose a pan with a tight fitting lid and have a 1/4 cup of water at the ready. In a 12-inch frying pan over medium-high heat, add 1/2 a tablespoon of canola oil and 1/2 a tablespoon of butter. 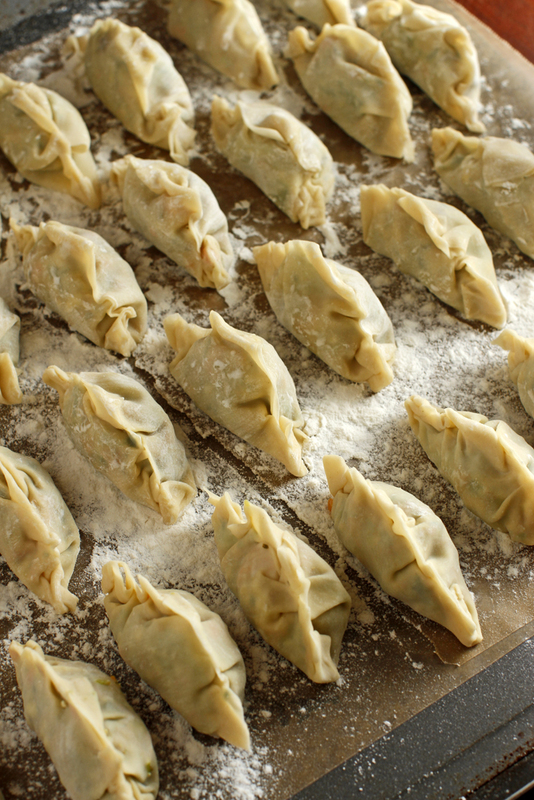 Place 10 dumplings into the hot pan and allow them to brown on the bottom. (This should take about a minute.) Pour the 1/4 cup of water into the pan and close the lid. Allow dumplings to steam for about two minutes. Repeat. Makes about thirty dumplings. Serve on a bed of Caraway cabbage garnished with green peas and chives. In a dutch oven over medium heat, sauté the onions in the olive oil until they start to brown. This should take about five minutes. Add the cabbage, red pepper, garlic, caraway, and vinegar. Toss to incorporate. Reduce heat to low. put the lid in place and continue to cook for at least 15 minutes, stirring on occasion until cabbage is wilted. Season with salt and pepper. I love a Sazerac cocktail. It is flush with so many complex notes: cinnamon, honey, herbs, mint, and a hint of dark tea. It's amazing, really. I decided to make an non-alcoholic iced tea that hits some of the same notes. It's quite delicious and festive. I think it would be the perfect thing to serve at your first outdoor BBQ in the spring. 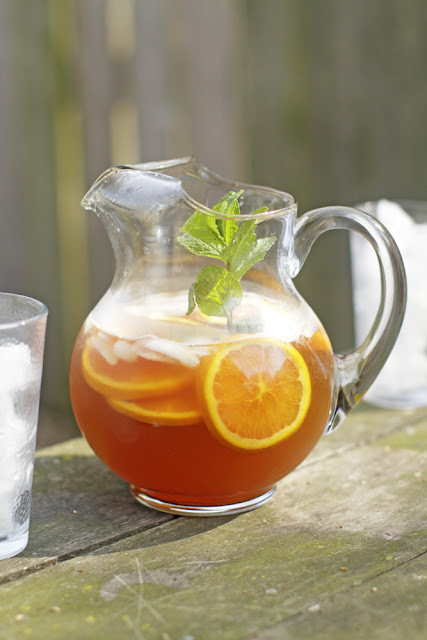 Place sliced orange, cinnamon, honey, and one of the mint sprigs into a two-quart iced tea pitcher. Add the tea bags an the hot water. Stir to incorporate the cinnamon and the honey. Allow tea to steep for three minutes. Remove tea bags and add ice. Add the reserved mint sprig to the pitcher. Serve poured over plenty of ice on a hot summer day. My good buddy J.C., manager at Central, was kind enough to share their secret recipe with me, so now you can make this amazing sandwich at home. It's the perfect thing to make in the backyard this summer -- especially if you expect to have a few vegetarians drop by. However, there is nothing like sitting on the front porch at Central BBQ with a tall, cold, beverage and enjoying this sandwich as hickory smoke wafts through the air. Yum! At Central, they make their own Italian dressing, and their house made BBQ sauce is killer. I've simplified the recipe here so you can make this in a hurry and feed the masses. Wipe mushrooms with a damp cloth to clean them. Choose a bottle of Italian dressing that is emulsified, meaning that it doesn't separate in the bottle. Marinate the mushrooms by pouring the Italian dressing over them and placing them in a sealed container in the refrigerator for at least an hour and up to twenty-four hours. Pre-heat your outdoor grill to high. Remove the mushrooms from the marinade and place them onto a sheet pan. Sprinkle both sides of each mushroom with my Memphis BBQ Dry Rub seasoning. Grill mushrooms gill-side-down for about seven minutes or until lightly charred around the edges. Flip the mushrooms over and place the cheese onto the gill-side of the mushroom. Grill mushrooms another three minutes or until the cheese has melted and the mushroom is nicely marked by the grill grates. 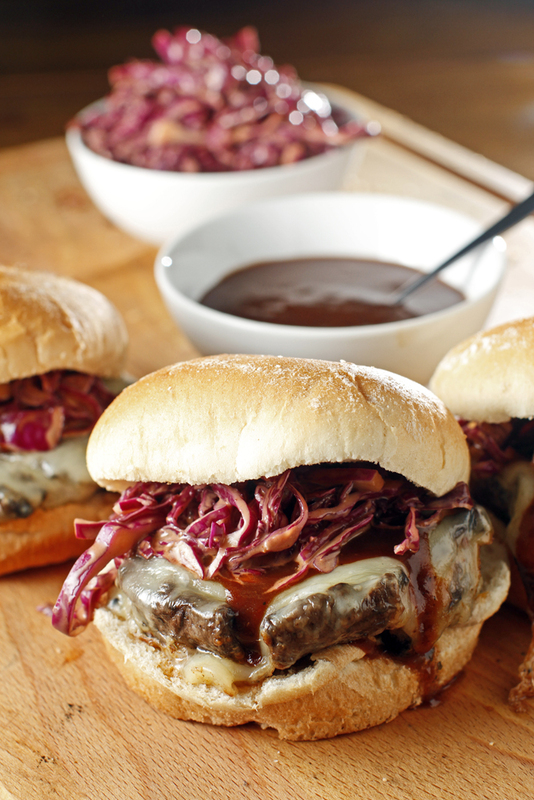 Serve each cap on a bun topped with a teaspoon of BBQ sauce and about a 1/4 cup of BBQ Slaw. Mix together one teaspoon of each: chipotle, smoked paprika, sweet paprika, garlic powder, salt, cumin, black pepper, brown sugar, thyme, oregano, and ancho chili. Store extra in an airtight container for six months. Toss all ingredients until well incorporated. This idea was born out of the Truffled Scotch Egg Chef Andrew Adams and I concocted and served at the Farmer Mixer. He, in all of his culinary awesomeness and food magic, showed the wife and I how to deep-fry an egg without overcooking the center. His method is incredible and yielded a perfect egg: crispy on the outside with a slightly set yolk. It was the hit of the evening. I wanted to figure to how to get the same result at home, but I don't have an immersion circulator or an industrial fryer (or an incredible kitchen staff full of talented chefs, for that matter). I tried soft boiling the egg and then tossing it in the flour mixture, but I kept breaking the yolk. It was a mess; we ate it anyway. Then I figured out how to poach the egg with the flour mixture already in place. That's the ticket. It works every time. Plus, it's super easy. The crispy egg spiked with the kinds of seasoning you'd normally find in fried chicken plus a little truffle salt makes a really special version of this soul food classic. In a saucepan over medium heat, bring a pot of water at least three-and-a-half inches deep to a simmer. In a small bowl, mix together the truffle salt, sage, thyme, garlic powder, pepper, flour, and panko breadcrumbs. Prepare an ice bath in a medium bowl. Place egg bundles into the simmering water for five to seven minutes. At five minutes, the white will be set, but the yolk will still by very runny. (If you leave it in for seven minutes, the yolk will be more set if that's how you generally like your eggs.) At the end of five to seven minutes, remove egg bundles and place them in an ice bath while they're still wrapped in the plastic. In a small saucepan over medium-high heat, bring canola oil up to 350 degrees. The oil should be at least two-and-a-half inches deep in the pan. Using your kitchen shears, snip the plastic just below where it was tied. Carefully unwrap the egg. Using a slotted spoon, lower the egg into the oil for a total of one minute or until it's golden brown. To serve, place one egg atop a warm waffle. Garnish with parsley, salt, and pepper, plus a drizzle of maple syrup. If you're serving this to friends or at a dinner party, you can do all the steps up to the frying beforehand. Then when your guests are hungry, dinner can come together really quickly. I have eaten an apple with lunch for as long as I can remember. I'm very particular about it. One of my sweet teachers from way back when told me later on that she remembered seeing me with a perfect apple every single day that she knew me. I am still obsessed with them. Very fairy tale, right? The best kind of all is a Pink Lady apple. They're reddish-pinkish-yellow-and-green. They are really sweet and really sour. Sometimes, they're hard to find, and I'll have a Fuji or a Honeycrisp instead, but I always come back to my favorite. For doughnuts in town, I like Café Eclectic and Gibson's, of course; if you haven't had doughnuts at both places, you've got to change that. 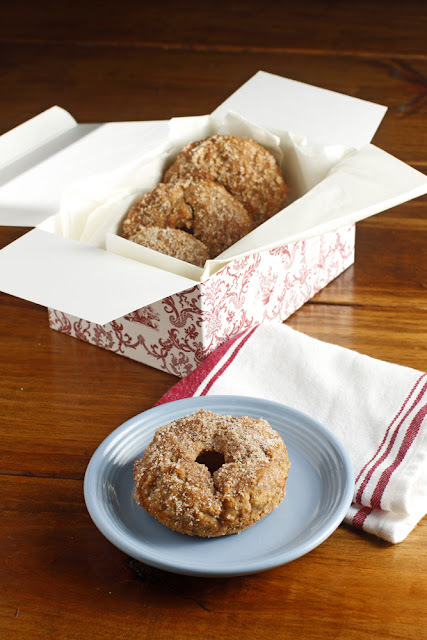 I also want to go to LadyBugg Bakery in Hernando and try their apple cider doughnut soon. I have this book from the Top Pot guys; it's good if you really want to get into making your own at home, and you can try their doughnuts at Starbucks sometimes. And if you're near Seattle, I am jealous because I miss my trips to Mighty-O. Preheat oven to 375 degrees. Pulse the shredded apple in the food processor a few times in order to break up any long strips, but don't make it apple sauce. Mix it with apple sauce, apple butter, canola oil, egg, sorghum, light brown sugar, lemon juice, and apple cider vinegar. Set aside. Whisk together the flour, baking soda, baking powder, sea salt, cinnamon, allspice, nutmeg, and clove. Gently fold in the dry ingredients with the wet ingredients; be sure not to over-mix; stop mixing when you can barely see the flour in the mixture. Use a silicone brush to lightly coat the doughnut pan with melted butter. Spoon in the batter and bake for about 15-20 minutes until the tops of doughnuts are golden brown. While they're baking, make the coating mixture. Melt the margarine and set aside. In another bowl, mix cane sugar, crushed maple flakes, cinnamon, and sea salt and set aside. Take them out and let them cool for a few minutes before loosening the edges of doughnuts with a non-metal implement like a plastic lettuce knife so you don't scratch the pan. Place them on a wire rack and brush them with melted butter before you spoon the dry coating mixture over them in a deep bowl or put some of the coating mixture into a bowl and swirl it around with the doughnut and press doughnut into it. A vegetarian blood sausage sounds absurd, and I guess it is a little crazy. However, I'm only taking inspiration from the original, not attempting to recreate it in any way. Traditionally, boudin, a regional New Orleans ingredient, is more like a rice and sausage casserole stuffed into a casing than what you expect when you hear the word 'sausage.' So, it kind of makes perfect sense to me to take the spices and the texture of the rice and add another savory flavor altogether. Here, smoked sun-dried tomatoes -- not pork -- provide the umami for this sausage. Once I made this, I couldn't stop thinking about it. It's that good. And, unlike store-bought sausages of any sort, you know exactly what's in it. It's good to make a double batch of this and freeze it. It goes well with red beans, or just slice it and put on a sandwich. The best way to serve it is like a hot dog on a french roll with sautéed onions and green peppers. Add a bit of my N'awlins sauce and some celery leaves to garnish. Make it and you'll consider yourself one lucky dog! Heat the canola oil in a medium pan over medium heat. Add the onion and celery to the pan. Cook until the onion is translucent and beginning to brown. Add the thyme, red pepper, paprika, garlic powder, oregano, salt and pepper. Add the wine and allow the mixture to reduce until most of the liquid has evaporated. Remove pan from the heat and place the cooked vegetables into the work bowl of your food processor. Add the parsley and sun-dried tomatoes. Pulse the mixture eight to ten times or until everything is finely chopped yet still distinct. Place the mixture into a large bowl along with the cooked rice and vital wheat gluten. (The wheat gluten is the binder that will hold the sausages together.) Mix it all vigorously by hand for at least two minutes. four-inch sections. Place a 1/2 cup portion (for smaller sausages, use 1/4 cup) on each foil and form it roughly into a log shape. (No need to be too precise.) Roll the foil into a tube and twist the ends like a Tootsie Roll; each sausage should be between four and five inches long. Repeat the process until all of the mixture has been used. Place foil-wrapped sausages into a steamer basket and steam them for 45 minutes. (My steamer is just a metal colander that fits nicely into my stockpot.) They will plump and take shape when steamed. Remove sausages and allow them to cool completely. When ready to serve, brush each sausage with canola oil before grilling. 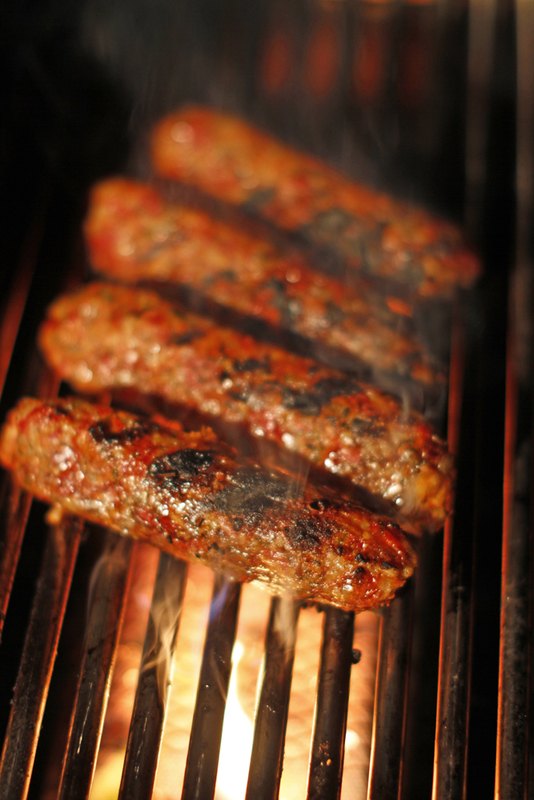 Grill on high for two to three minutes per side or until well-marked. 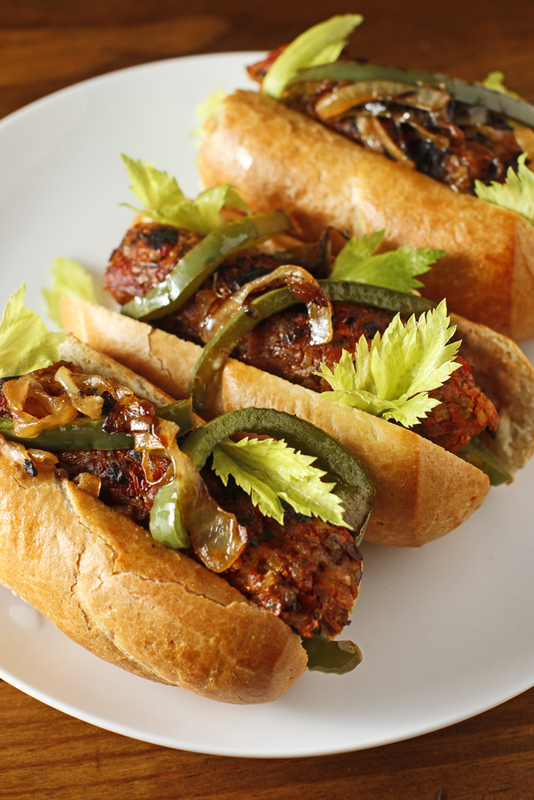 Serve on a warm French roll with sautéed peppers and onions, plenty of N'awlins sauce, and celery leaves for garnish. I think I dreamed about this one early Sunday morning because I popped right out of bed and got to work. It looks like a lot to do, but the steps are really simple. Plus, you'll have more biscuits than you'll need for this dish. You know what that means...snack while you cook! The espresso in the gravy adds instant oomph. That paired with the mushrooms makes for a super-savory gravy that you'll make again and again. Underneath you have a poached egg with a runny yolk, plenty of wilted greens, and a craggy biscuit supporting the whole dish. It's got a lot of appeal. 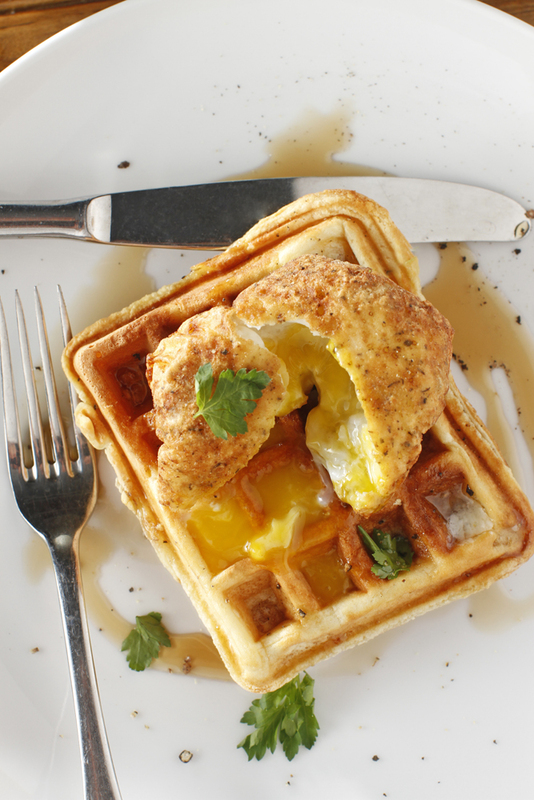 This is the perfect thing to make if your friends are coming over for brunch. I can guarantee they've never had anything like this before, and you can make everything ahead of time so all you have to do is heat and assemble when it comes time to eat. In a large pan over medium heat, bring an inch and a half of water to a simmer. Add the salt and vinegar to the water and return it to a simmer. Poach eggs three to four at a time by slowly cracking the egg into the simmering water and allowing it to cook for four to five minutes or until the white is set. Remove egg from the water and set aside on a paper towel until ready to serve. Split a buttermilk biscuit in half and place onto a plate open-faced. Place 1/4 cup of wilted spinach on each half. 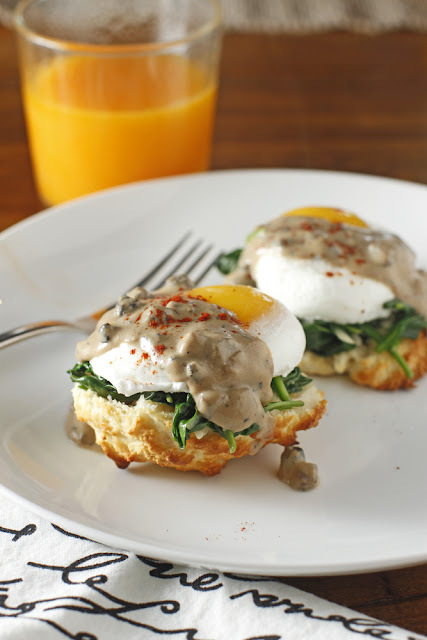 Top each half with a poached egg and about a 1/4 cup of the Red-Eye Gravy. Garnish with smoked paprika. Repeat. Preheat your oven to 425 degrees. Mix dry ingredients in a large bowl. Using your fingers, cut in the shortening until pieces are no larger than a pea. Make a well in the center of the flour mixture. Add the milk. Using a rubber spatula, fold the milk into the dry ingredients -- but use as few strokes as possible. The less you stir the dough, the more tender your biscuits will be. Using a medium ice cream scoop, scoop up a 1/4-cup portion of dough and drop it onto a parchment or silpat-lined baking sheet. Repeat until all dough has been used. (You should get about a dozen biscuits from this recipe.) Be sure to leave an inch or so between each biscuit, but don't be too particular about their shape -- drop biscuits are supposed to be rustic. Bake for 15 minutes or until the craggy edges are brown and crispy. Melt butter in a medium pan over medium heat. Add the diced shallot and cook until translucent; this should take three to four minutes. Add the fresh spinach one handful at a time; stir the greens in between each addition so that the heat from the pan wilts them down. Once the greens are wilted, turn off the heat and set aside. In a medium pan over medium-high heat, melt one tablespoon of butter. Add the mushrooms and the black pepper, red pepper flakes, and salt to the pan and cook until mushrooms begin to brown (about five minutes). Add the espresso to deglaze the pan. Cook until most of the liquid has evaporated. Push the mushroom mixture off to one side of the pan. In the clearing, add the remaining tablespoon of butter. Once it's melted, add the flour and whisk the two together. Allow this mixture to cook for a minute until the flour becomes fragrant. Whisk in the milk, liquid smoke, and maple syrup. Stir constantly until mixture begins to boil. Reduce heat to low and cook an additional five minutes until mixture is thick. I've had this dish written on a piece of paper on my desk for, like, six weeks now. It's next to scrawled notes that read stuffed hush puppies, boiled peanut cmilis (I can't read my writing), and Carolina Gold arancini. I'll get around to those eventually, but I sure am glad I made this particular dish tonight because it's an unexpected marriage that actually works. The creole mustard and the cornbread take this salad way down South for a trip you're not likely to forget...especially if you make it using my Smoked Cheddar Jalapeño Cornbread. Preheat oven to 350 degrees. Place cornbread cubes on a parchment-lined sheet pan in a single layer. Put cornbread cubes into the oven for a total of fifteen to twenty minutes or until golden brown. In a large bowl, whisk together the lemon juice, mustard, mayonnaise, garlic, worcestershire sauce, honey, and pepper. 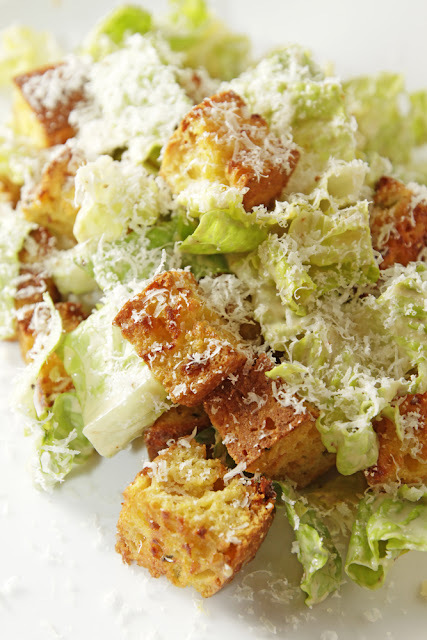 Using tongs, toss the romaine lettuce and the cornbread croutons in the dressing. Divide among plates and garnish with parmesan. The worst insult that any can give your cornbread in the South is that it's "just a little dry." No one will ever say that about my version. I've packed with good stuff like buttermilk, local honey, and best of all, smoked cheddar. 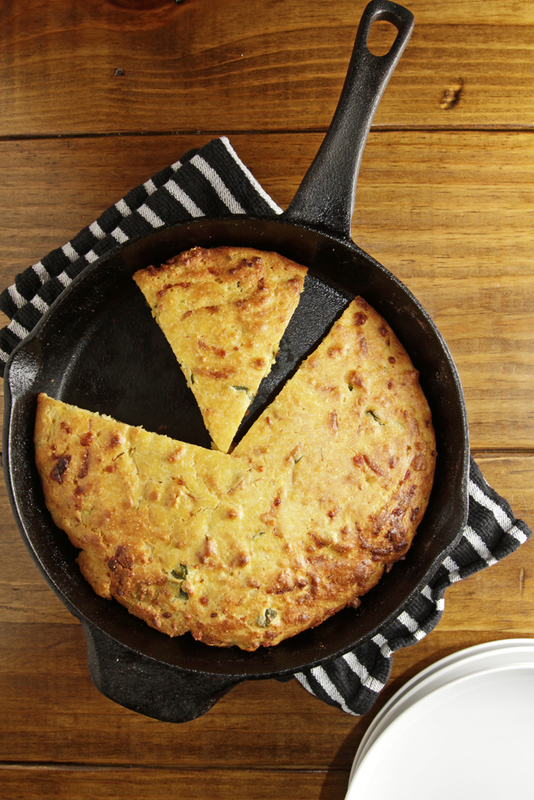 The smoked cheddar gives the cornbread an authentic quality that's missing in many bacon-grease-less cornbread recipes. all-purpose flour, baking powder, salt, cheddar, and jalapeño. In a medium bowl, melt 1/4 cup of the butter. Add the honey, eggs, and buttermilk to the melted butter and whisk. Next, add the wet ingredients to the dry. Stir until just incorporated. Using a sturdy, reliable oven mitt, carefully remove the hot cast-iron skillet from the oven and place it onto a trivet. Place the remaining tablespoon of butter into the skillet and swirl it or use a silicone brush to coat the bottom of the pan. Pour the batter into the pan and place the pan into the oven for twenty to twenty-five minutes. Run a knife around the edge and turn the cornbread out onto a cutting board. Serve hot with beans and black eyed peas. When I first heard about coconut bacon, I pinballed around the internet to see what I could find. I landed on The Food Network site and watched a video of Chef Jesse Kimball of The Memphis Tap Room, which is located in Philadelphia, Pennsylvania, make this amazing looking, crunchy, smoky, non-bacon bacon. I have been looking for a vegetable medium or process that will have that crispy crunch like bacon. Along the way, I've stumbled upon some pretty cool things, but I think that this coconut idea is the Holy Grail. So, inspired by Chef Jesse's brilliant idea, I whipped up a batch using a bag of shaved coconut we had in the pantry. I added soy sauce, vegetarian worcestershire, and maple syrup to the mix for that sweet Southern bacon-y flavor. And, hey, it worked! The coconut takes the smoke beautifully, and when it's baked, it the inherent fat in the coconut crisps the flakes. The best part is that they stay crispy. You can make a big batch of this and have it for lunch all week. We have used this many different ways since first making it: as a garnish for an omelette, on pesto flatbreads, and on top of grits, but my favorite has to be my avocado BLT. 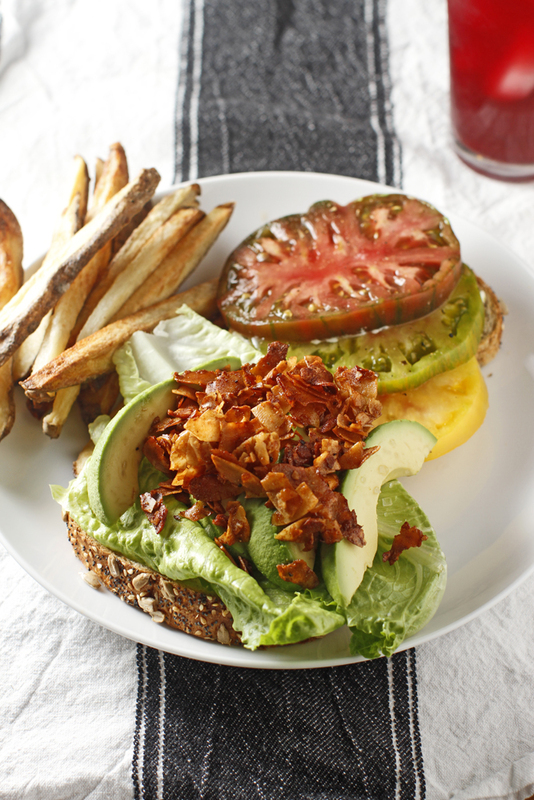 All you do is load up two slices of seeded whole wheat with sliced heirloom tomatoes, olive oil mayo, crunchy romaine, sliced avocado, and plenty of Smoked Coconut Bacon. It's beautiful to hear the crunch of the bacon when you slice the sandwich in half. At the Memphis Tap Room, Chef Jesse Kimball has half of his menu devoted to delicious vegan and vegetarian food. He serves a Smoked Coconut Club with lemon garlic tofu and herbed mayo. It's good enough to win over anyone's palate. I wanted to know more. Luckily, Chef took a few minutes to chat with me. The Chubby Vegetarian: You're not a vegetarian, but you have an interest in vegetarian food. Where does that come from? Was it to impress a girl? 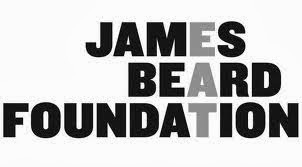 Jesse Kimball: I have been vegetarian and vegan at different times, and my parents are vegetarians, so it has been a part of my life. 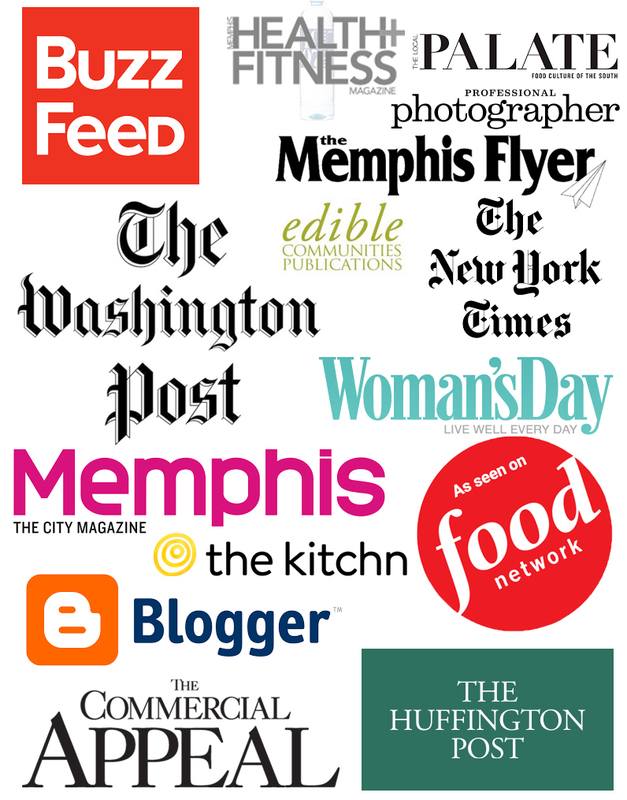 When we opened a bar (Memphis Tap Room) specializing in craft beer, we put an emphasis on food that craft beer drinkers like, and a population of them are vegan/veg, so we wanted them to be happy. I love cooking vegan food cause I can really use proper techniques, but just change the ingredients. TCV: What lead you to the coconut? It couldn't have been the first thing you thought of, or was it? it lacked the texture that the coconut gives the sandwich. One of the cooks here told me the punk rock vegans were pouring liquid smoke on young coconut and calling it bacon, so that got me thinking. In NYC, the peanut vendors have these smoky little carts with honey roasted nuts and coconut, so I applied the bacon-making technique with the smoked walnuts using shaved coconut, and the result was great. Actually curing the coconut and smoking it gives it a great bacon-like quality. I never tried the liquid smoke technique because I don't like liquid smoke. TCV: You work at a place in Philly called the Memphis Tap room. What does the name Memphis evoke north of the Mason-Dixon? JK: We're just on Memphis Street here in Philly. It doesn't have anything to do with Egypt or Tennessee. 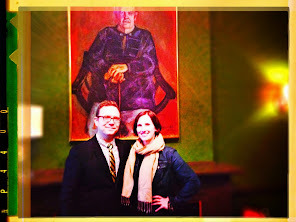 You're more likely to hear Elvis Costello here than that other guy. I'm a record guy, so the name Memphis evokes Sun, Stax and Goner, The Oblivians, The Reatards. It's been a while now, but sorry for your loss on that one. Oh yes, and that movie Mystery Train. Smoke the coconut flakes for four minutes using my grill-top method. Four minutes don't sound like a long time, but the coconut really soaks up the smoke quickly. This ain't no pork belly, y'all! Preheat your oven to 350 degrees. Place the smoked coconut into a large mixing bowl and add the maple syrup, soy sauce, pepper, worcestershire, and sesame oil. (Only add the liquid smoke if you didn't smoke the coconut. This is just an option for people without access to a smoker.) Toss to coat. Spread the dressed coconut into a single layer on a parchment-lined 12-by-17-inch sheet pan or two smaller pans. Cook coconut for ten minutes, stir it around and spread it back out on the sheet pan, and cook it another five minutes or until coconut is nice and dark brown.